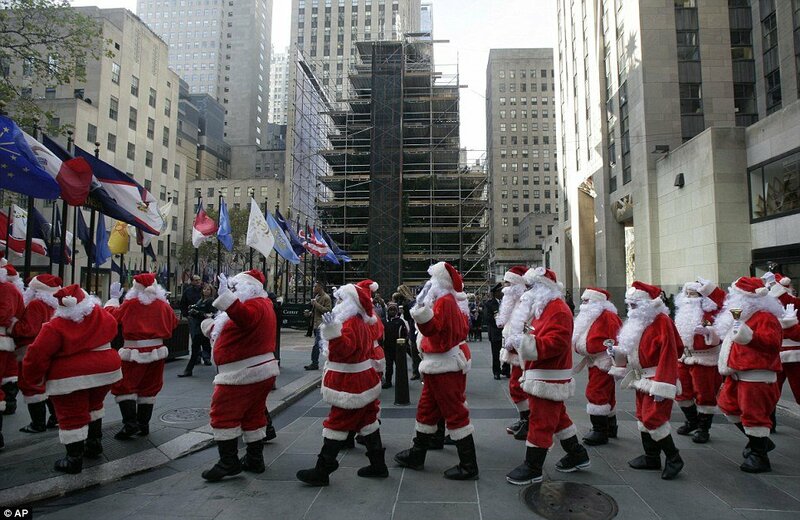 The annual Sidewalk Santa Parade is another post-Thanksgiving tradition with a huge serving of ho-ho-ho along Fifth Avenue in Manhattan. The 110th annual Sidewalk Santa Parade has been around since 1902. Fifty fully suited, bell-ringing Sidewalk Santas were part of the Friday festivities. After their jolly old stroll, the Volunteers of America Santas were whisked away – not by sleigh, but by bus. The donations they raise will be used for a holiday food voucher program for needy residents. “Our sidewalk Santas are marching and parading, as they have done for 110 years, to remind New Yorkers that now’s the time to remember our neighbors in need who are hungry,” Rachel Weinstein of Volunteers for America told NY 1. The unique parade’s route stretched from 50th to 59th Streets down Manhattan’s glitziest Avenue. The Saint Nicks, Kris Kringles and Father Christmases spread the holiday cheer as fir trees began cropping up on street corners around New York and stores started to play Christmas carols to get shoppers ready for the festive season.